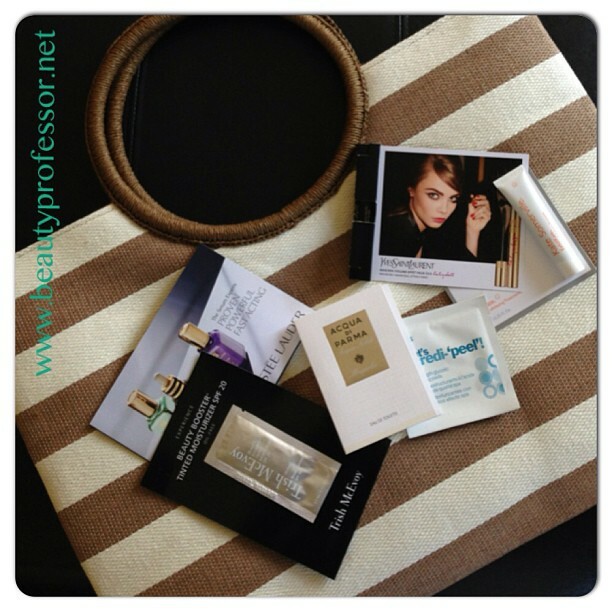 Beauty Professor: Post Preview for the Week! Today marks my last official week of "school year teaching" and I am so excited about my upcoming Beauty Professor blog posts! Above: This bag is large enough to fit a plethora of items for poolside lounging...water bottle, sunscreen, makeup, sunglasses, extra shirt and visor; it's utterly cavernous. First, I will be using this divine bag (above...procured from the latest Neiman Marcus beauty event, Camp Gorgeous) to tote around my pool essentials when I head to Tucson next week. I will be covering a my beauty essentials packing list, which, in this case, will be tailored to inordinately hot and dry weather. 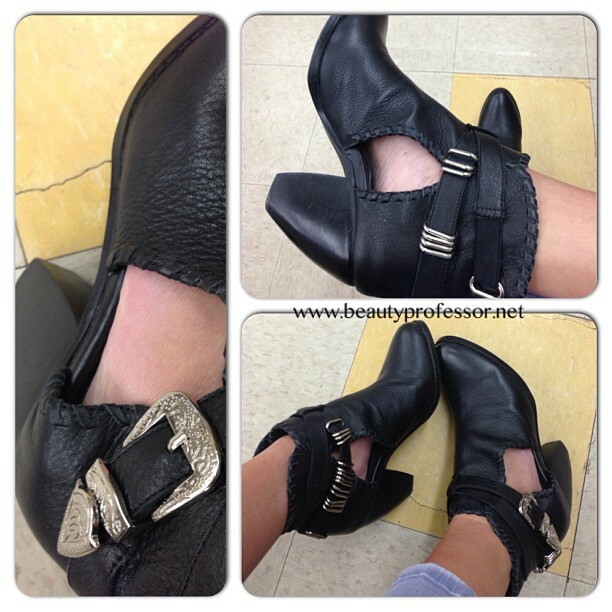 Above: My new Madison Harding x Lust for Life collaboration Olivia booties...so immediately comfortable that they didn't even need to be broken in! Next, I will be talking about a the summer shoe shopping I've been imbibing in as of late. A little Madison Harding, a pinch of Vince Camuto, a lot of Jeffery Campbell...no, it's not makeup, but it does make for amusing conversation, no?! Above: Olivia of the style blog, Lust for Life and me at a recent Mark Jacobs event...I have had Olivia as a student at the college and am proud of her boot endeavor! Above: MAC All About Orange...what did YOU pick up from the collection? Above: All 16 shades of the Hourglass Immaculate Foundation, resplendent on my laptop. Finally, and this post may come before all of the aforementioned (should I get an immediate chance to label the copious amount of images)...swatches of all 16 shades of the Hourglass Immaculate Foundation (reviewed HERE). I am positively giddy at the chance to feature another exhaustive shade range for a foundation I adore! Above: Swatching on the mind. Above: Sample jars, pre-swatching...I almost hated to sully their pristine state by opening them! Above: Swatch City...and a bit of MAC Flamingo on the lips. Also, I by request, I have plans to discuss the brushes (including the quintessential non-brush, the Beauty Blender!) I have been using lately as well as providing an overview of how to determine your skin tone to find your perfect foundation match...so much to do (including a bevy of by-request videos for my YouTube channel! ), and a whole summer in which to make it a reality! What's new with you this week? Thoughts? New purchases? Summer plans? Wow! lucky you have a break. Enjoy your vacay! And I say yesssss to the shopping. I'm such an enabler LOL! I adore Hourglass Immaculate Liquid Foundation. Thanks, Kath! I am really looking forward to the vacation and am expecting very hot weather (108 degrees each day!). Time to get drenched in sunscreen! 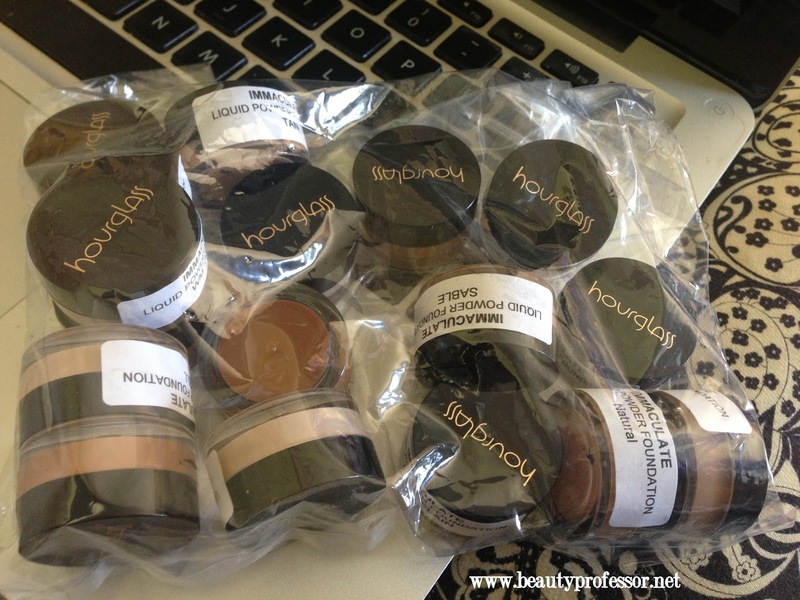 Thank you also for the shopping enabling...much appreciated ; ) The Hourglass Immaculate Foundation is amazing, no? Full expanse of swatches of the formula should be live before the weekend! Hi BO, looking forward to the HG foundation swatches, my spacenk doesn't stock a wide range of the shades, so I'll probably have to order it online. What shade so you think is closest to NC45 in mac? Looking forward to all the fun things you have in store for us! I, too, lost my mind a little bit with the All About Orange collection. I made three trips to my local MAC and ended up getting four of the lipsticks, two blushes, and the eye quad. One ticket for the Hot Mess Express, please! Haha :) Talk to you soon! Hi B.P! Thankyou for ALL the swatches from hourglass and thankyou for the sneak-peek of things to come! Looks like as soon as school is done, you have your work cut out for you. Or should I say for us?! Can't wait. Those mac lipsticks? Omg, makes me want to get in my car & head to Nordsrom now! lol I am loving all things coral for the summer. I mentioned I ordered the benfit fake-up hydrating concealer. Really like how it hydrates & conceals to help those nasty fine lines that seem to get worse as my day goes on. Tried it at work today and will test out its longevity again and report back. I've just been gettn so dry lately under the eyes. also ordered Tarte c-maracuja under eye brightener cream. a client of mine says it works well. That should be comin in soon. Thanks again for all the swatches. I'm loving my LMdB foundation! Hope to talk soon. Good to hear from you ; ). I am so glad you liked my posts and yes, by next week, I should be embracing some serious blogging time! How wonderful that the Benefit concealer is working for you...I will have to take a peek at it the next time I'm at Sephora. 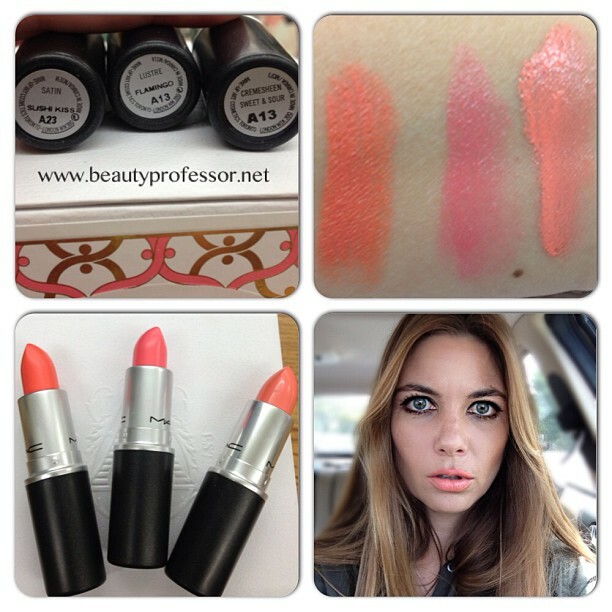 I hope you are able to track down the peachy MAC lippies should you wish...usually those LE collections sell out in a flash (which might explain my impulsive acquisition!). I am thrilled that you are still enjoying the LMdB foundation...it is such a gorgeous formula! 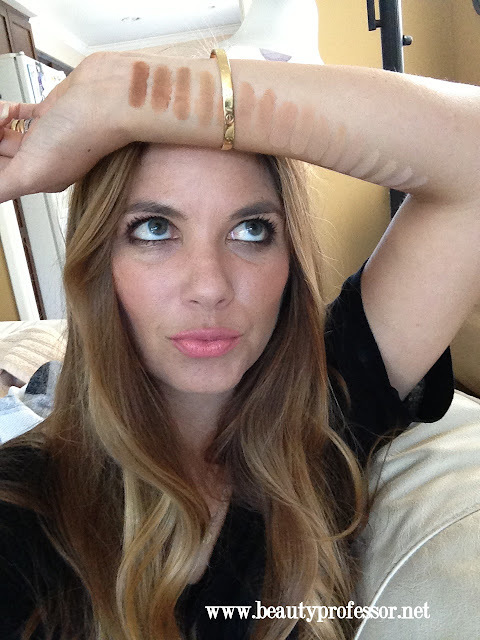 I just have to ask: in the picture swatching on your mind, are you wearing the sensai cellular foundation? I really love the finish of that foundation but have no idea how to order it. I guess i'll have to call directly but I'm not sure what exact stores carry it. Yes, I am wearing the Kanebo Sensai foundation in the first picture...the glow from this formula is so up your alley! Aside from Amazon, the only retailer I know of that carries this is Neiman Marcus. It's not online, though, so I suggest calling the Kanebo counter at your nearest NM!